Now and Zen you want to send something tall, and extra special. It's got to be unique, tropical and of course, beautiful. 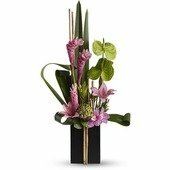 That is a tall order, but this arrangement handles it with panache!